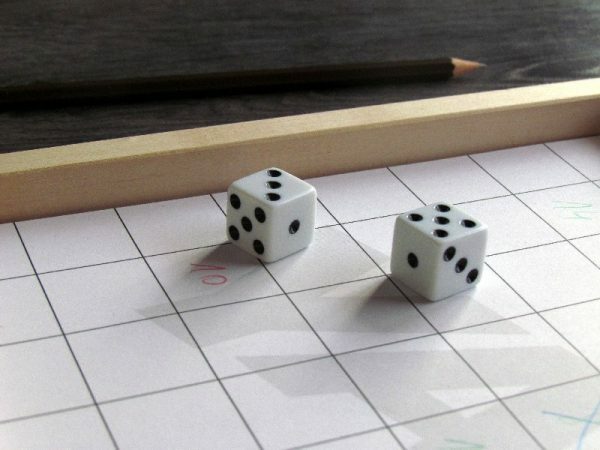 Do you know how to properly rejoice, when you roll dice on the table and they show exactly dots, that you wanted? Yay! That’s the correct style of shout suitable for celebration of this exact moment. 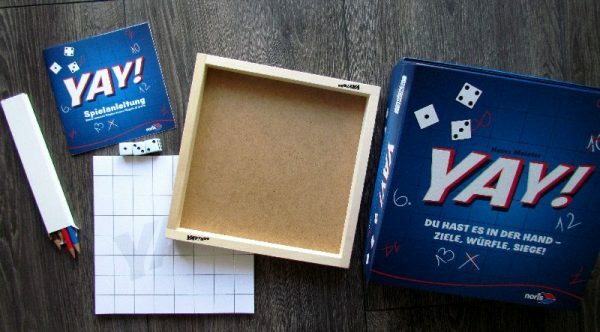 And trust us, that you will practice it properly in board game Yay! The author of this fun box is Heinz Meister and he created it in 2012 for German company Noris Spiele. 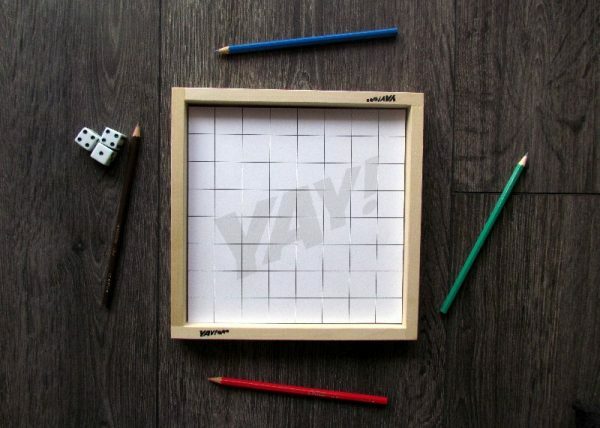 Your medium is blue box, which offers as its main contents game board surrounded by a wooden railing. This one is laying on the bottom, but you should now take it out. This board has exactly sixty-four square spaces on it. 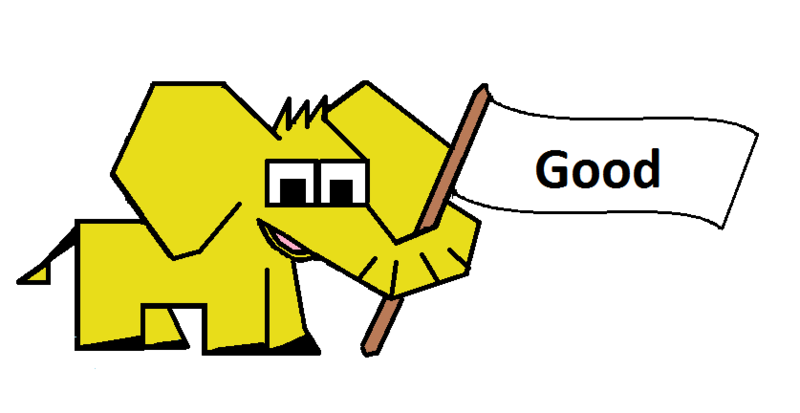 They are printed on paper, because every game needs a new fresh one. 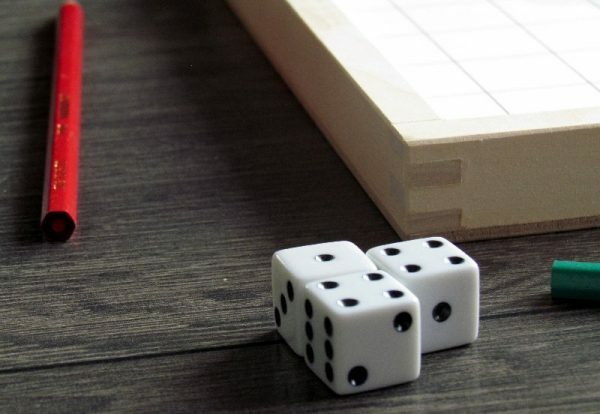 Besides space to border their interest, players will also enjoy a trio of white casino dice together with four colored pens – each player gets one for game start. 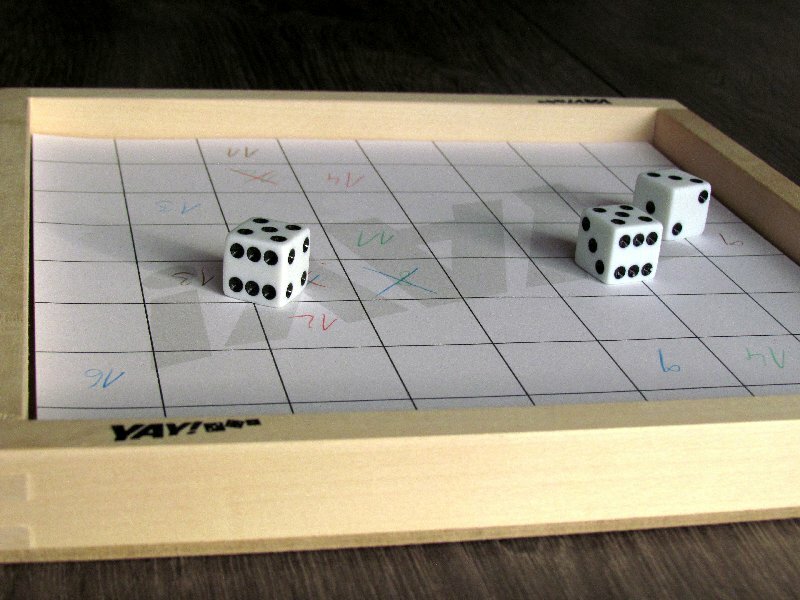 Players take turns in the game and roll the dice at the beginning of each one. The most important is sum of all dots. This number is not the only thing, that matters. Its also important to roll the dice well, so they stop in good place. Boxes, that one of the dice is touching is the only place, where player can type the result inside. 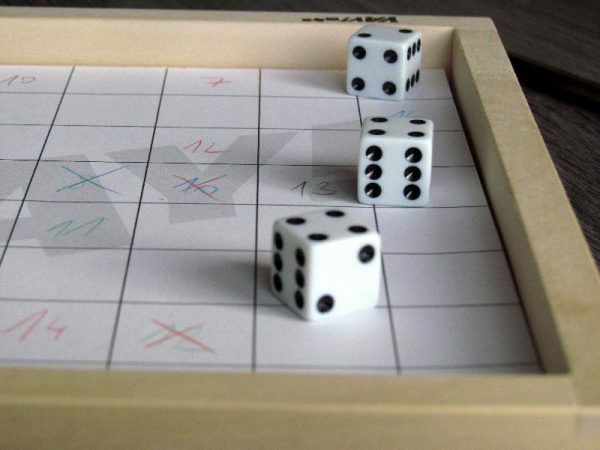 Instead, player may decide, that he is not satisfied with sum (or dice position) and he wants to improve it. That player can roll again. But his turn will come in vain (no number written), if he rolls lower number, that before. 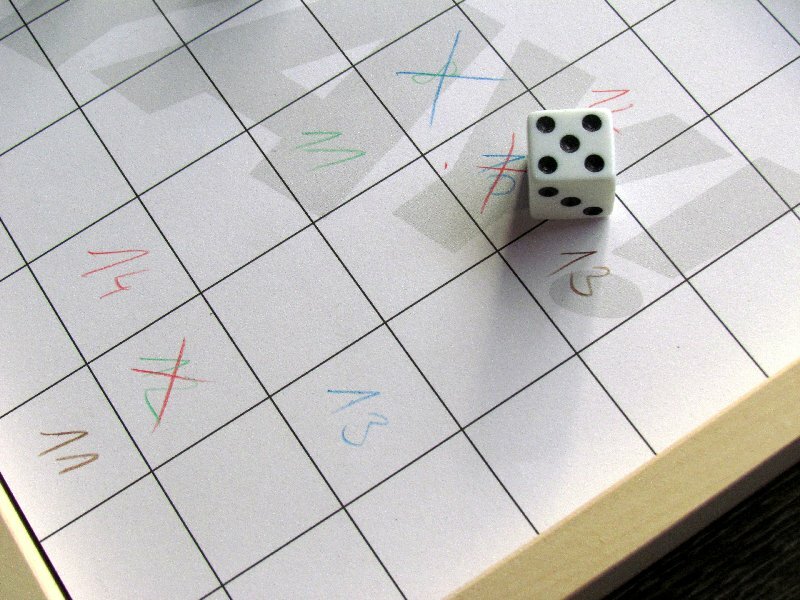 If a player chooses to end re-rolling on time, he simply writes the sum with pencil of his color into one of the boxes, that dice are currently touching. Once the square has value, no one can change it. But that still does not mean, that the value is irreversible. Conversely, if one of the players manages to fill box next to it with higher value, then he may cross out boxes with these losers (horizontally and vertically). Players roll dice, write down their sums and cross out opponent values turn after turn. Everything continues until continuous row or column of numbers (even crossed) appears on the paper board. 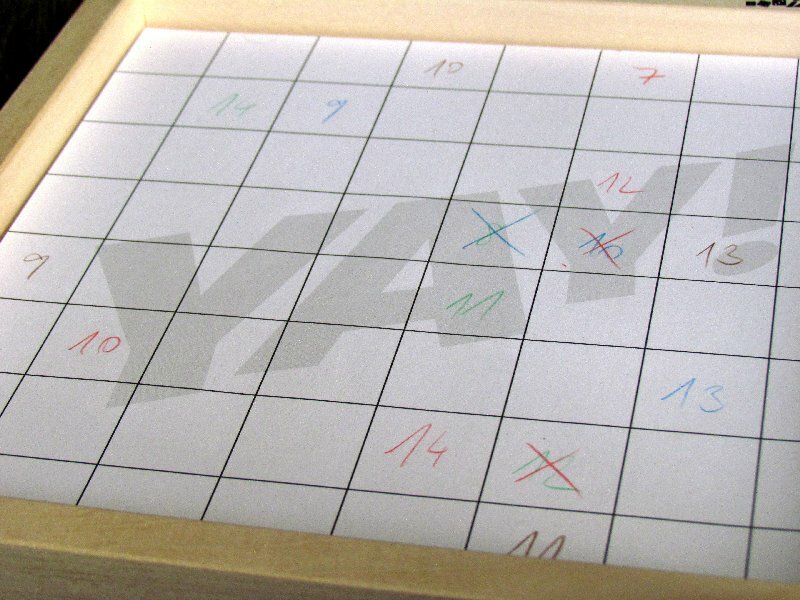 Then, players add up amount of their boxes (filled with their color), that survived enemy attack and none of opponents has crossed them out. Whoever has the most points is the winner. Yay! 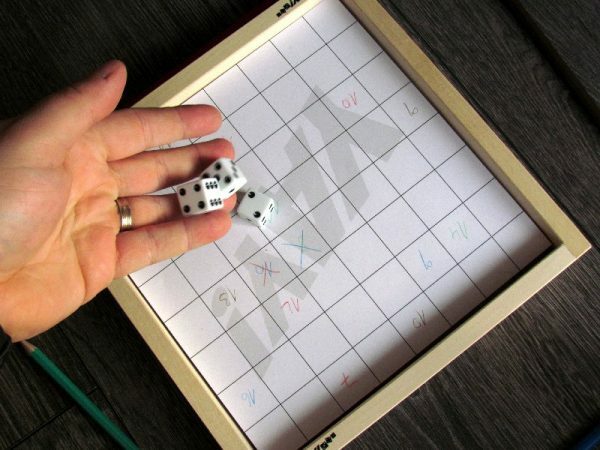 is a crazy dice game. At the same time, it will surprised by not being just about dice and their results. Players must play very well tactically, positionally, but also be able to take risks. In addition, game also uses element of dexterity. Basis of the game is ability to take risks at the right time. Opponents are fighting in positional play with their numbers, which always seem to be low. 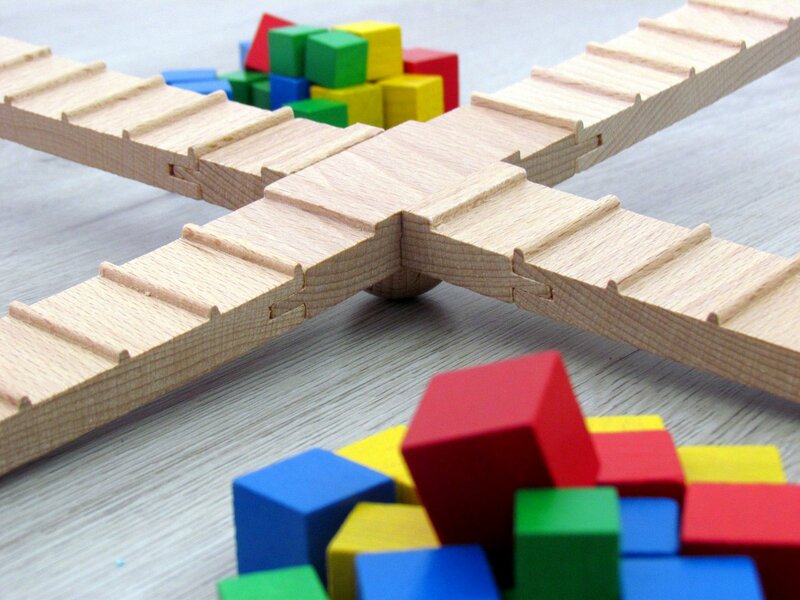 Player himself must decide, whether value is sufficient and if he believes, that it can survive to the end, not being blocked by one of his opponents. 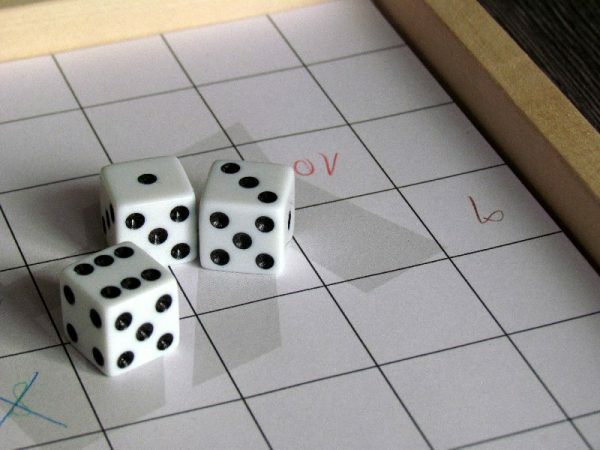 The most important and interesting element is dice position. 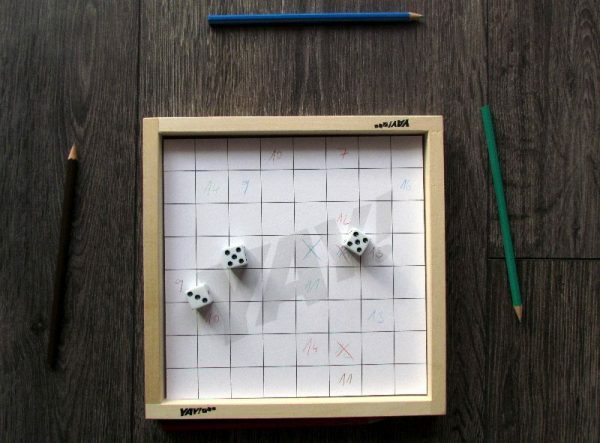 A player may place his sum only in spaces, where free square is touched at least by corner of one dice. And here, skill enters the game. The player must roll the dice cleverly, so they end its movement, where he wishes. Fortunately, it is not necessary to hit target with first attempt, because players have possibility to constantly re-roll their dice. But their new sum must be greater, than the previous one and this is not always easy to achieve. Game is surprisingly conflicting and players have everything in their hands. By placing their numbers in the correct place, they may decide which neighbouring values are crossed out and which will survive. Players can harm each other intelligently, block others and prepare positions for points. And this is the way to victory. Game is very dramatic, situation is constantly changing and players will not give anything for free. Game in multiplayer causes players to not have much control. Indeed, in two players, whole gameplay is longer, but rivals may better affect their positions and chances to win. Yay! is definitely a challenging game for lovers of dice and tactics. 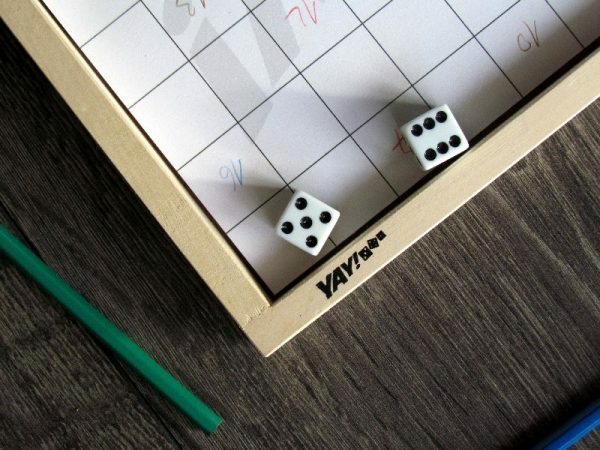 It’s more of a relaxing fun with dice, which needs a little bit of thought as well. 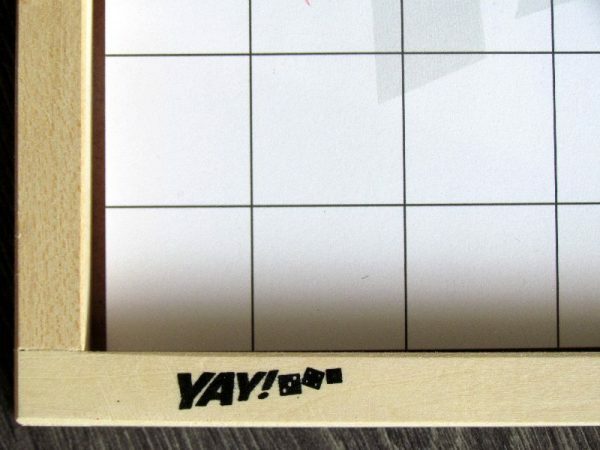 Base is light-headed fun with a pinch of this and that, combined together and creates Yay! as a very interesting mix. Yay! is not only dice game. In addition, it is also a game of skill and tactics. All this in a special way merged into one creation, which is quite comfortable playing. 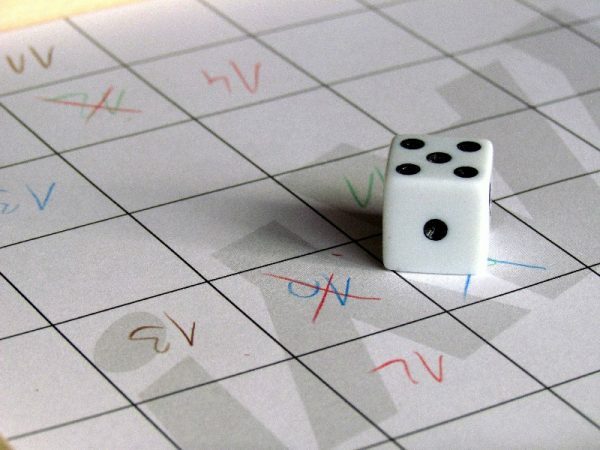 Rolling the dice on target, writing down numbers and eliminating opponent's values is fun. Game is fast, dynamic and interesting. You just have to be its target audience. Not everyone is. Yay! will not be a cup of tea for absolutely everyone, but if you like dice, then you can sit down. play it and be not disappointed. 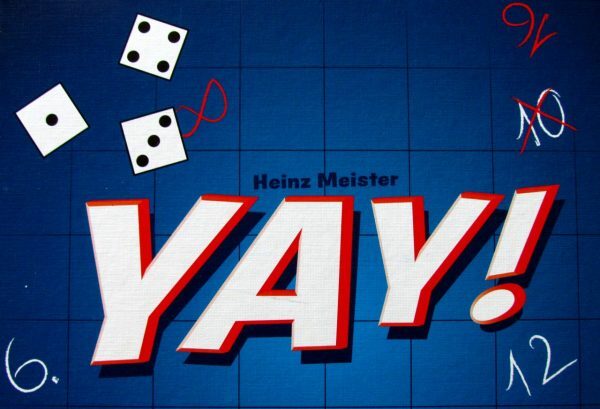 2012, Heinz Meister, Malovani-podle-cisel.cz, Noris Spiele, Yay!